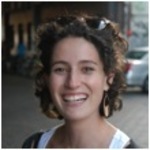 Ilana Cukier will graduate from the University of Amsterdam in the summer of 2012 with a degree in History of International Relations. She focuses on the Second World War, the Holocaust, genocides, German history, remembrance cultures, and the way nations and cultures deal with their past. Two years ago, she spent a semester in Berlin learning German and attending courses about monuments in Berlin and the GDR at the Humboldt University. Since she returned from Germany, she has been working at a high school, teaching history lessons. In September 2011, she began an internship at the German Institute, where she worked at the education department, preparing new course material about freedom and democracy in Europe. She currently attends master classes with the campaigning bureau BKB on campaigning, lobbying, and public speaking, which included a study trip to the 2012 Republican primaries in the United States.